Your journey to confidence begins here... Over to Elaine Sihera, and you! What is confidence and how do you go about getting more of it? Well, read on... Whether you have low self-confidence or you're just interested in building and improving your confidence, you'll find it all here! You'll find tips, quotes, and even an email course or two (on confidence). And I finish with a definition of confidence from personal empowerment author Elaine Sihera (listen to the video below). As always please do get in touch! "Yeah, you're right - I do look good in black!" fearlessness and, ultimately, feeling happy"
The thing is, you know when you're feeling confident: cooking a favourite meal, or talking to old friends; and you know when you're not: when you're either doing something new, or when you're doing something that you've told yourself you can't do. Yes, I do this all the time - don't you? Mingling in large groups, for example - I often feel uncomfortable and low in self confidence. to become, and people will start seeing you as that person." you see the confidence you already have. Download here! 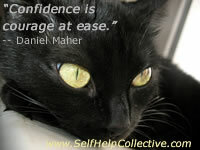 Share this self confidence page - thanks!